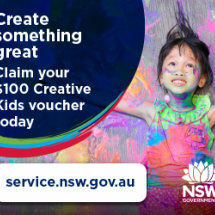 From 2019, NSW parents, guardians and carers of young people can apply for a $100 voucher to use for creative and cultural learning activities outside of the school curriculum. In January 2019, Marion Chapman will run a kids art workshop and your child can attend using the creative kids voucher. See "Workshops' tab for dates.